San Francisco-based Jasmin Zorlu started crafting hats 19 years ago. Along the way, she designed shoes for Esprit, worked with master theatrical milliners making hats for Broadway and Off-Broadway shows, sold a hat collection to Barneys, designed for Goorin Brothers, and was commissioned to create hats for Erykah Badu. After all that, she is still amazingly down to earth and excited about designing and creating freeform blocked headwear. After a spell in New York and the excitement of her Barneys collection, she spent six months in Paris making hats. With one hat block and a teakettle, she created an entire collection of original hats in that time. Her ingenious use of materials like fish skin leather illustrates this. 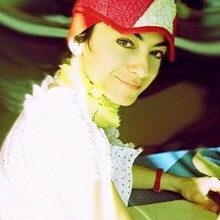 As a testament to the originality and creativity of her work, one of her original creations drafted in Paris (a hybrid between a Parisian firefighter cap, a fedora, and a garrison cap) became a best seller for Goorin Brothers. Erykah Badu spotted Jasmin’s Molecular Mermaid Helmet at a hat shop in New York in 2003 and immediately ordered a custom version in her favorite colors and proceeded to perform shows with it. Other celebrity clients include Neil Young, who purchased one of Jasmin’s hats as a birthday gift for his daughter, and Tom Waits, who bought one for his wife. Aside from coming up with original hat designs and being commissioned to design for photo shoots and weddings, Jasmin teaches millinery workshops at least four times a year for those who want to learn how to make hats. Recycling is her most current inspiration: creating hand-draped, hand-stitched cashmere hats and finding new life for men’s blazers. Find her hats locally at Wonderland SF in the Mission, Hats on Post in Union Square, the Gray Area Foundation’s Archetype boutique, or Mill Valley Hat Box in Mill Valley. You can also find her hats this weekend at the American Craft Council show at Fort Mason.